Here we are together once again, this time for issue #5 of the Adventures of the Super Sons! Last time around we saw our boys get away from the Gang with the help of Space Cabbie and Joker Jr. However, Rex ended up getting what he wanted all along in the form of the Hypercube. After some back and forth chatting, and Joker Jr. ditching them, the boys meet future versions of themselves at the end. But that was basically it as not much happened in the last issue. Does #5 pick up the pace at all? Let’s dive in and find out! 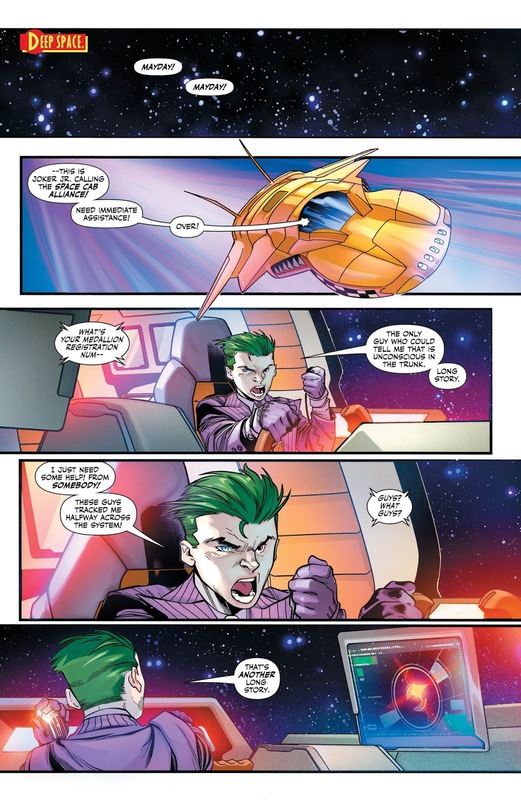 We start off with Joker Jr. in trouble and reaching out to the Space Cab Alliance for help, though he quickly realizes it is too late. Rex has found him, destroys his ship, and takes him back to be made an example of in case any of the other members of the Gang are thinking of defecting. Meanwhile, our boys talk with their future selves and it is classic, quintessential Jon and Damian banter… times two! Both Jons are having a good time and talking about food, while both Damian's are being skeptical and trying to figure out what’s going on. Eventually, our team (Super Sons Squared?) encounters a pair of alien brothers - which is suspect from the beginning – who welcome them to the “Planet of Mysteries and Secrets.” The whole scene tells us that something is amiss, and the art reinforces that things aren’t as they seem. 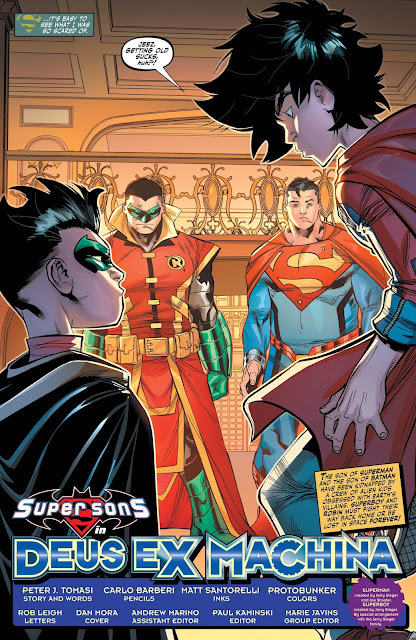 We do get a splash page that I really enjoy, where Future Jon talks with our Jon across the page from Future Damian talking with our Damian. Art is solid throughout as usual, though I have to say Jon’s hair looks extra wild in some panels. Each future version shows our heroes that their lives end up exactly as they hope – before revealing they both have sons of their own! But then everyone acknowledges that none of it is real – though totally possible – before its revealed those aliens from before have our boys captured and using the “Wonder Machine” on them. Turns out the more clever of the two brothers is the Wonder Machine and basically the planet itself! Essentially it feeds on people that land on the planet and turns their dreams into almost reality? A little confusing, but that’s the basic idea of it. 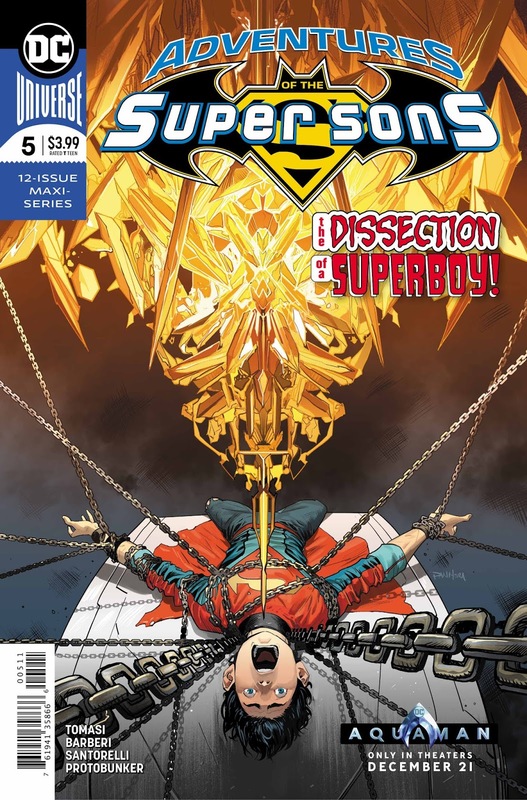 There is some fun meta stuff Tomasi goes for when the future versions of the boys (who were really just figments of imagination almost brought to life by the Wonder Machine) break out of their imaginary state of being to help free our boys. The older, imaginary versions of our boys were inspired by their younger, real counterparts enough to become real… Only to then sacrifice themselves so our boys can get away. It is very comic book-y stuff. Maybe even Morrison-esque (Wonder Machine, Wishing Machine?). Sometimes it’s tough to grade this book because I always find ways to enjoy each issue. 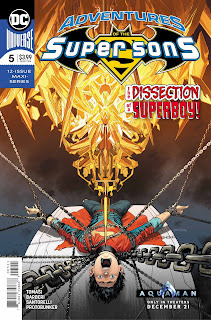 This was fun and included lots of homages for longtime followers of Jon and Damian’s exploits (including in Tomasi’s respective runs on Superman and Batman and Robin), but we are on issue #5 and I am a little unsure of where this story is going. We didn’t see much of the gang and for as much fun as I had, there was basically no plot development. I’m always gonna give Tomasi the benefit of the doubt, but I hope things pick up soon. 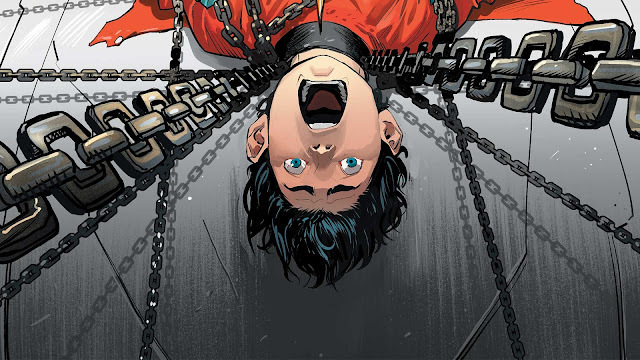 I enjoyed this issue more than last so I feel like my score must reflect that, but plot-wise we’re basically where we were when Joker Jr. abandoned our boys' last issue.